David Attenborough calls humanity a plague on the Earth. Isn't he sort of right? David Attenborough Calls Humans a “Plague on the Earth.” Isn’t He Sort of Right? 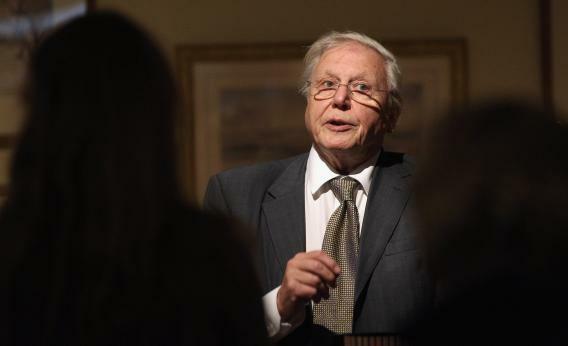 Sir David Attenborough addresses the audience at the opening of an exhibition of Edward Lear’s artwork in the Ashmolean Museum on Sept. 19, 2012 in Oxford, England. Every now and then, Britain’s best-loved naturalist takes a break from spying on the bedroom behavior of birds of paradise to sound off about humans’ impact on the environment. When he does, it almost always makes headlines—not only because he’s Sir David Attenborough, but because he calls it as he sees it. In October, he took Mitt Romney, Barack Obama, and America at large to task for their failure to face up to climate change. That sentiment may have ruffled a few feathers stateside but is relatively uncontroversial in his home country. This time, in an interview with the UK TV-listings magazine Radio Times, he stepped in it a little deeper. But Smith is exactly wrong. If anything, environmentalism has grown progressively pro-human since the 1960s and ’70s, when books like Paul Ehrlich’s The Population Bomb spooked a generation of activists into advocating various desperate population-control measures. Such sentiments are so rare in the environmental movement these days that it made national news in 2011 when one lonely group dared broach even the mild suggestion that voluntary birth control could be good for the planet. Other environmental groups the Times contacted for the article “generally declined to discuss the issue or did not return calls,” upholding a longstanding taboo on the topic. These days the most effective environmental arguments seem to be those that tie climate change to deadly extreme-weather events like Hurricane Sandy. Complex and slippery as those associations may be, they work because they tap into people’s strongest instinct: self-preservation. Modern environmentalists have fully internalized the lesson that you don’t get very far by telling people that their very existence is the problem. So why would Attenborough say such a thing? Because, at 86, he’s an unreconstructed member of the old guard. Because he’s a knight and a national treasure and there’s no one to tell him he can’t. But more importantly, because his life’s work has given him a fundamentally different lens on humanity. As a naturalist and nature-show host, his livelihood is intertwined not with the stock market or the gross domestic product, but with the fortunes of the world’s non-human species, from insects to penguins to lemurs. And when you look at it purely from their vantage point, there is no denying that humans have made quite a mess of the land, not to mention the sea. Calling humanity “a plague on the Earth” isn’t politically correct, and life would be grim indeed if everyone shared Attenborough’s assessment. Even if they did, it’s not at all clear that population control would be the solution. Still, in a way Attenborough’s remarks are a refreshing corrective to the overwhelmingly anthropocentric thrust of today’s environmental movement. Of course humans should care foremost about humans, but in recasting environmental policy as a question primarily of economic costs and benefits, we risk forgetting the obvious: We are not the only species on this planet. And even as we’re rightly fretting on the effects of sea-level rise on New York City 50 years from now, the plants and animals with whom we share the Earth are getting pummeled by deforestation, desertification, overfishing, and ocean acidification. Fortunately, the problem isn’t as straightforward as Attenborough’s excerpted quotes make it out to be. Yes, there are a lot of people on Earth, but a steady easing of population growth rates is expected in the coming decades even in the absence of population-control policies. And yes, we could eventually be in danger of running out of space to grow the food needed to feed everyone, but that’s as much a function of Western consumption habits as sheer numbers. In short, what we need in the world is not necessarily fewer people, but a lighter environmental footprint per person. A man who can sneak up on a lyrebird ought to know something about the possibility of treading lightly.